Australia requires a modern integrated joint national force structure for its defence. The purpose of Air Power Australia is to contribute to the development of such a joint force structure. Air Power Australia is a non-profit entity established with the primary aim of air power research and analysis, especially in the context of a modern integrated joint national force structure. Air Power Australia is not affiliated with the Department of Defence, the Australian Defence Force or any other Commonwealth organisation. 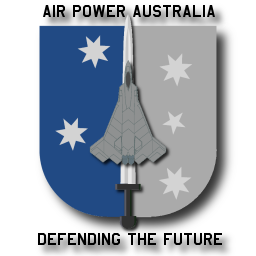 The Air Power Australia website was established in October, 2004, with the aim of promoting air power; stimulating public and parliamentary debate on air power topics; educating the community; and, publishing and archiving papers and articles on air power topics. The website covers a wide range of air, land and sea warfare topics, especially where these are related to the integration and synergy of air, land and sea warfighting capabilities. The views stated in posted articles are those of their respective authors, and all posted materials retain the copyright of the respective owner or owners. Australia is on the threshold of a major reduction in its relative military capabilities against the broader region. Since the early 1990s the region has experienced unprecedented growth in military capabilities, most noticeably in air power and in modern guided weapons, largely of Russian origin. In this rapidly evolving strategic environment, Australia is actively reducing the relative capability of the Royal Australian Air Force (RAAF), rather than seeking to maintain its historical advantage in capability. This capability reduction is being effected in the short term by premature retirement of the F-111 strike fleet, which provided around 50% of the nation's strike capability. In the long term, myopic insistence on a single type replacement of the F/A-18A and F-111 forces, the preferred Joint Strike Fighter to be used in roles it was not defined for. It is thus not expected to provide the capability advantages historically enjoyed by the RAAF, as it is a battlefield strike and close air support system rather than a general purpose fighter bomber like the F-22A. Numerous industry proposals to affordably increase RAAF capability exist, for instance by further expansion of the tanker fleet using surplus commercial airliners. Unless Australia rapidly implements aggressive policy changes in long term planning for the RAAF force structure, Australia's slide in capabilities relative to the Asia-Pacific-Indian region will continue unabated. Air Power Australia was founded by Dr Carlo Kopp and Mr Peter Goon. The research findings presented by Air Power Australia are derived from rigorous quantitative analyses that have been peer reviewed in order to provide a benchmark for analytical technique and debate in Australia. Air Power Australia does not seek to dwell on the question of who is right or wrong when it comes to Australia's defence capability needs; Air Power Australia will focus on what is right for Australia and future generations of Australians. We hope APA website and associated endeavours contribute to securing a more appropriate air power force structure for the defence of current and future generations of Australians. Our future will depend on an RAAF force structure which is more cost effective, reflects the innovative Australian ethos and carries far less risk than that currently planned for by the Department of Defence.